Diabetic Cats in Need - Helping diabetic cats and their people since 2009. Have you seen our new website? Take a look! It's more dynamic than this one, and we hope it's a little easier to navigate. We will not be updating this site any longer, so please start using the new site to stay up-to-date on cats helped and what's going on at DCIN. If you'd like to update your bookmarks, the URL is http://dcin.info . Please look around and let us know what you think! You can reach us on Facebook or by emailing info@dcin.info . DCIN is pleased to announce its fourth annual Extra-Sweet Kitties Calendar Contest! Head on over to our site on GoGo to enter. If you didn't enter a kitty into last year's contest, you'll need to create an account to enter this year. If you registered in previous years, your account should still work. The contest runs from October 16th through November 17th at 11:59:59 PM Eastern. Each entry costs $5, and each vote is $1. You can also reserve a calendar day for $10 each - first-come, first-served, and please keep your caption request as short as possible (remember that it has to fit legibly on a date square; if it's too long, we'll need to ask you to shorten it). 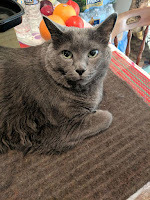 Reserving a day is separate from the contest; if you want to see your kitty both on one of the main calendar pages AND on a special date, you need to enter the contest and reserve a date separately. All the contests rules are on the contest site under "Rules". And of course - there are prizes! The Top Cat gets his/her photo on the cover of the DCIN 2018 Calendar, a comfy and attractive handmade cat mat, a free copy of the calendar, and a cat food mat and keyring set. The five Runners-Up get a prominent spot in the DCIN 2018 Calendar, a free copy of the calendar, and a cat food mat and keyring set. This year, we're also offering the option to pre-order a calendar through GoGo for $27 including shipping to all locations. You can find this option under the "Participate" button in the top menu bar. We'll offer a calendar-ordering option through DCIN later on, as well. More details on that later in November! We're hoping this year's contest is just as fun as it has been the last three years. Happy voting! Many DCIN Friends LOVE socks - the crazier the better. What could be better than SolMate's Mismatched Socks to pad around in? So we bring you our sixth annual mismatched socks fundraiser for DCIN. Through October 8, 2017, DCIN is taking orders for these socks - and more! That's right - just like last year, you can order ANYTHING the Sock Lady offers! You can choose from adult crew socks, adult ankle socks, adult knee socks, kids' socks (one pair and a spare), and baby socks (two pair and a spare). And now you can also choose from adult hats, baby aviator hats, fingerless mittens, scarves, and fleece-lined mittens. You can check this brochure for the styles, patterns, and sizes available. The items are made from 62% Cotton, 22% Polyester, 15% Nylon, and 1% Lycra. They are machine washable and dryable. If you care to take orders from your workmates/friends, there is a bulk order form as the last page of the brochure. You will have to submit this payment with your order by October 8. If you have questions about this, please email socks@dcin.info. Please add an additional $5 per order for Canadian mailings and an extra $10 per order for mailings to other international locations. Please make all payments in US $! Let me tell you what I did today. Pictured below is Vasika, or Vasa for short. Vasa is absolutely beloved by his human, an elderly gentleman on a fixed income who lives near me. 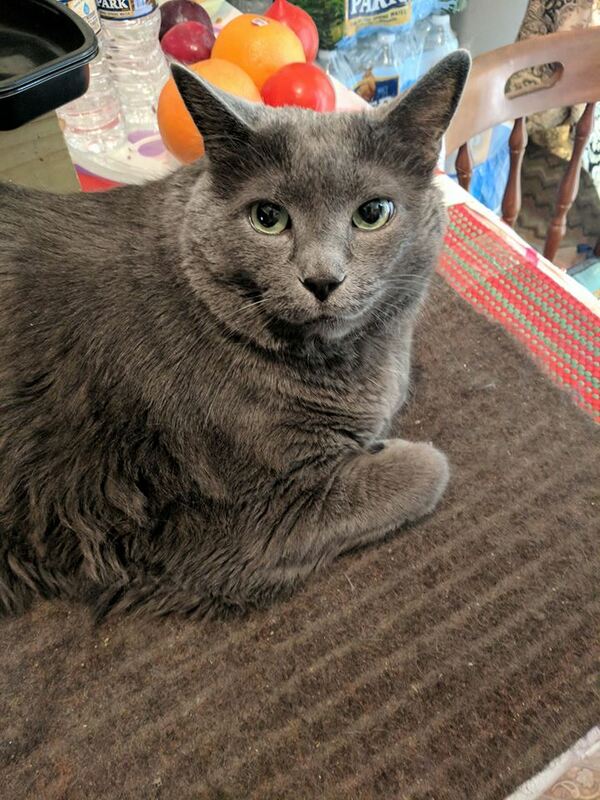 Vasa came to live with his person just about 10 years ago, showing up within weeks of the gentleman's wife passing away. He is convinced that Vasa was sent to him by his late wife, and he treasures this cat. You might be able to tell from the picture that Vasa is a rather fat cat. I thought I'd gotten a full body photo, but I didn't. if I had, you'd see that he is easily 30 lbs of cat! So it's not surprising that at his last vet visit a little over a week ago, he was diagnosed with diabetes. With his person on a fixed income, there was no way for them to afford treatment. The gentleman's daughter started looking on the internet to see if there was any way to get some help. It was then that she discovered Diabetic Cats in Need. Jenna Watts, DCIN's Executive Director, reached out to me and asked if I was located anywhere close to the gentleman and Vasa. Turns out I live about three miles from them. So today, thanks to donations that support DCIN, I was able to bring diabetic appropriate food, a glucometer, test strips and lancets, a new vial of Lantus insulin, and some diabetic appropriate cat treats. We went through a little more than an hour of training on how to test, and his diet will be being switched to low carb wet only food to try to naturally and safely get some of that weight off of him. This is one of the critical mission areas DCIN serves. Without their assistance, this gentleman would not be able to begin treating his beloved cat. When I say that every penny of every donation directly benefits a cat, I mean it, and this is the proof. DCIN 2017 Annual Auction - Donations Requested! Hello, DCIN fans! The DCIN Team is asking for goods and services to be donated for our 4th annual online auction. 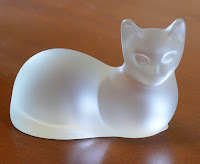 Auction items should sell at a reasonable price: $8 to $100, including postage. We are looking for services of any kind that might have international appeal and items in good to excellent condition that are not so fragile they might break with mailing through the United States Postal Service. You can see the types of items donated and sold in last year's auction album. Donors hold their items until there is a successful auction winner who has paid DCIN directly for their items. A DCIN Auction Team member will then contact the donors to let them know that the items are ready to mail and provide them with the name and mailing address of their item's winner. A clear photo of the individual goods being donated, displayed in an appealing manner. Multiple photos of the same item are welcome, especially those that show different sides of the same item. A brief but detailed description of the goods or services being donated, including condition and size. The minimum bid amount for the individual goods or services being donated. If you know the regular retail value or the item, please include that. Whether you also will be donating the cost of postage for the goods mailed within your country. If you will not be donating the cost of postage, the approximate mailing costs. Currently, we plan to start the auction on Sunday, March 5, 2017, at 8 PM Eastern and end on Saturday, March 11, 2017, at 8 pm Eastern. We MUST HAVE your photos and information about your auction donations by Sunday, February 26, 2017. Thanks so much to all who are considering donating items for this auction. With your donations, we expect this to be a very successful fundraiser. Show your DCIN Pride! In addition to our T-shirts, sweatshirts, and totes (sold via dedicated fundraiser twice per year), we now have mugs and magnets available for purchase by our supporters. 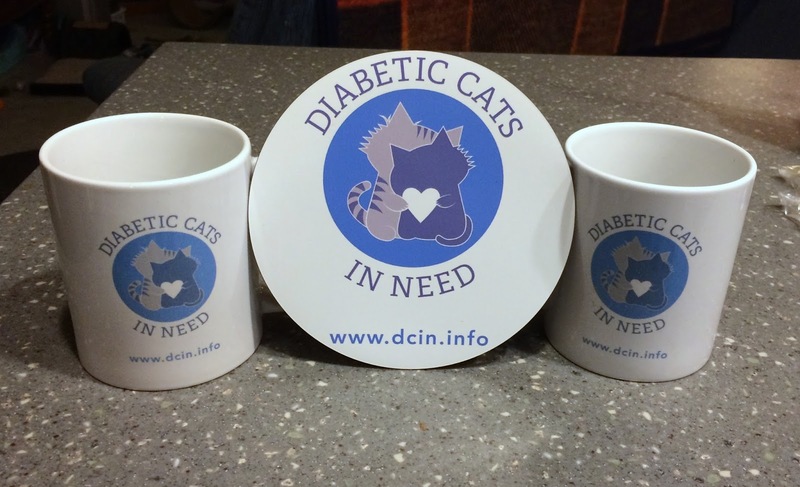 A generous donor loved our new logo so much that she has provided us with custom mugs and magnets with the DCIN name, logo, and URL for us to sell to support our mission. The mugs are dishwasher safe, as the design - printed on both sides of the mug - is sealed on the mug. The mugs hold 11 ounces. The magnet is made for indoor and outdoor use, so you can use it as a fridge magnet, but also show your DCIN Pride on your vehicle. It's large enough for people to easily see the logo and read the words! Want to buy one of each? Send us $34. Want to buy multiple mugs? The cost is $20 for each additional mug. Want to buy multiple magnets? The cost is $6 for each additional magnet. This is a VERY LIMITED EDITION. We only have about 40 of each item, and when they're gone, they're gone. If there's a continued demand for them, we can see if we can get more, but for now...this is it! First-come, first-served. family" option, then select "friends and family" to avoid fees on cash and checking donations. If you use a credit card, please choose to pay the fee (so DCIN doesn't have to). Include your order details (how many mugs/magnets) and where you'd like them shipped. 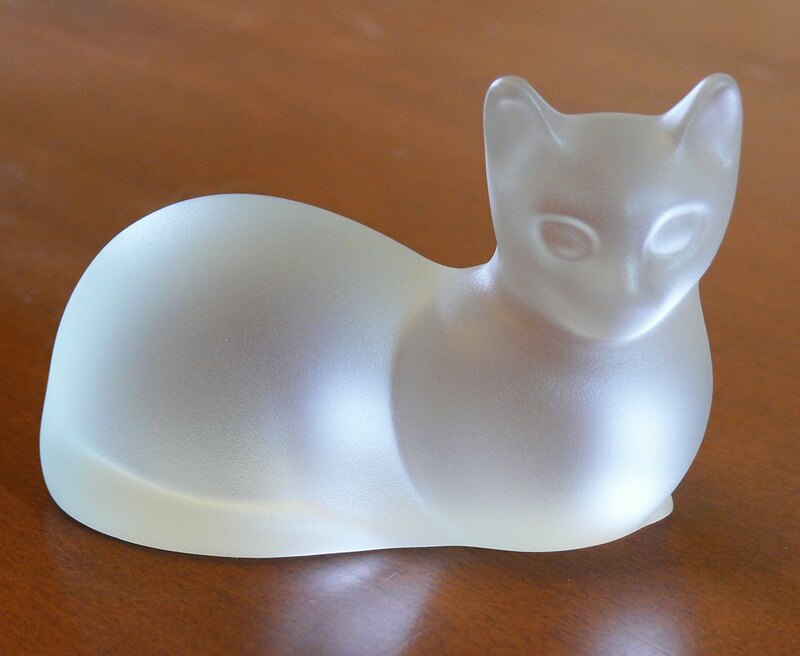 I'm sure I don't have to mention that these would make fun gifts for the cat-lovers on your list! :D Thanks for supporting DCIN. 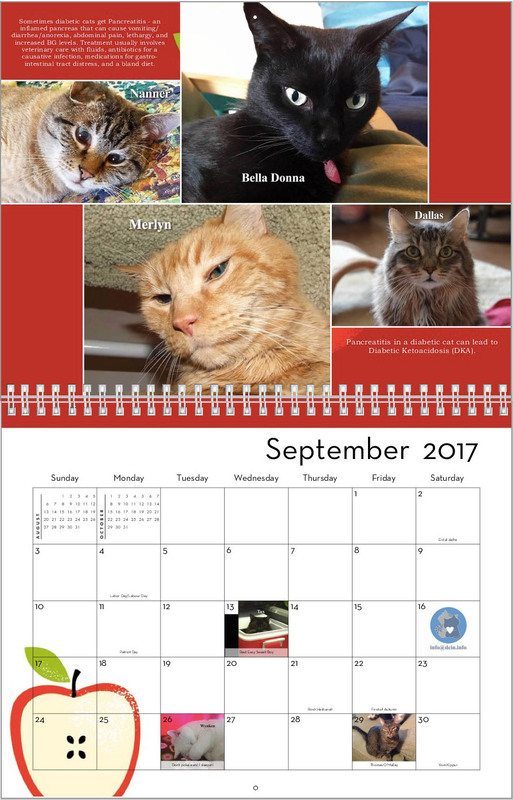 Order your 2017 DCIN Extra-Sweet Kitties Calendar TODAY! We are now accepting orders for the 2017 8.5" by 11" twelve-month Extra-Sweet Kitties wall calendar! The prices listed below include mailing costs. To order, please PayPal the appropriate amount for the number of calendars you wish to order and the location where they will be sent to calendar@dcin.info by choosing the "pay or send money" option, then selecting "send money to friends and family." If you fund your payment with a credit card, please also pay the credit card fee on the final PayPal screen. (If you don't, DCIN will have to make that payment.) In the "Write a note (Optional)" section, please include your full mailing address or that of the recipient. New this year! 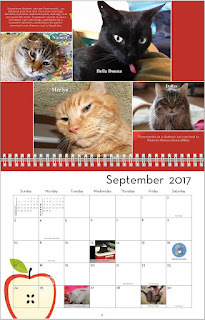 Orders direct to vets/shelters -- $18 per calendar (please pay in US$ if you live internationally). We are pleased to offer a reduced-cost option this year as a trial. We'd love to get the word out about DCIN and the best ways to treat FD, so please help us by sending a calendar straight to your vet or favorite shelter! DCIN is accepting orders for the 2017 calendar through November 12, 2016. We want to get the calendars received, shipped, and delivered before the US Thanksgiving holiday on November 24, in case you are gifting calendars to friends/family. It may take longer for international locations. Thank you all so much for supporting DCIN's 2017 Extra-Sweet Kitties Calendar!